Antonio Pisanello was in Italian painter and medalist best known for his decorative frescoes and portraiture executed in paint and bronze. 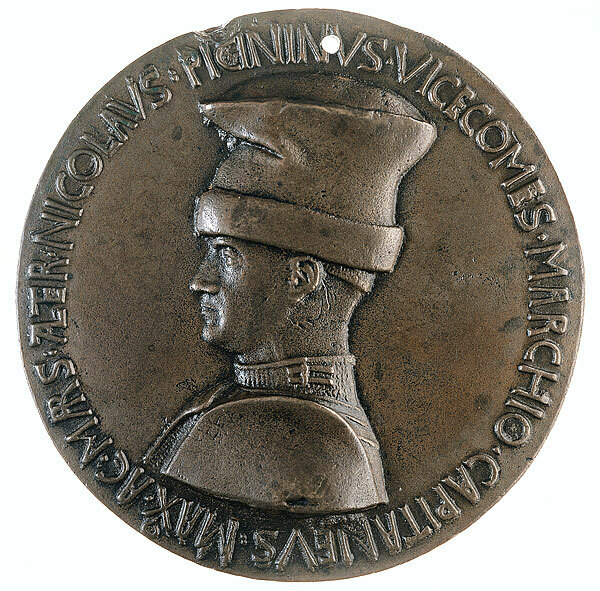 Popular in the courts of his day, Pisanello was the inventor of the personal commemorative medal, a medal portraying important figures of the day that became very popular during the Renaissance. J.G. Pollard notes that the innovation of such an item is little appreciated today due to its familiarity to the public, but that it was quite unique in its day and may have derived from Roman era coins. These medals have become very useful for historians today, allowing them a glimpse at some of the era’s most important civic figures. Few of his paintings exist, solidifying his modern reputation as primarily a portraiture medalist.